When there are eight other Councils in the same area, the Regional Council is important as having an interest in those activities which cross all eight areas: transport, including public transport, water, air quality, etc. They don’t ‘stop’ simply because they reach an artificial political boundary. Wellington has a high level of commuting and there must be a public transport system to match, both buses and trains, while also recognising the other modes of private car use, cycling and walking; water quality is obviously important just as is security of supply (and issues in both these areas can arise in New Zealand. Rates are increasing at a level well above what is expected in these low inflation time. Of course expenditure will take place but GWRC rates increasing by 9.8% (2015 / 16) and set at 7.6% (for 2016 / 17) alongside Wellington residential rates at an average of 5.8% means there must be constant controls and monitoring – and not everything may be possible! I believe I can make a real contribution, my background being in both senior management and governance, including the operations of Local Government. I have the experience and understanding to contribute effectively to the operations of the Regional Council, ensuring the interests of ratepayers are well represented. Ian is proud to be a Wellingtonian - by family, education and work. Ian is also proud of the City - where he lives, works and walks. 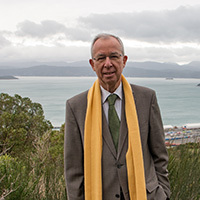 A former Wellington City Councillor, having first been elected to the Council in October 2004 and then again in 2007 for the Lambton Ward - the Ward for the inner city and immediate suburbs. He is proud to be in a position to continue to serve his city and with your support, will be able to do so.